The hackamore is a viable alternative to the bit that can be particularly beneficial when riding a young horse with a sensitive and developing mouth. It’s also useful on any horse that has had a mouth injury or has trouble wearing a bit. Additionally, it’s a valuable standalone training tool due to its unique way of applying pressure and signaling the horse that provides a fresh and different feel. When used correctly, it can add refinement to lateral control, promote lightness, and enhance self-carriage. For you and your horse to enjoy the benefits the hackamore has to offer, an initial adjustment to fit is necessary. Follow these set-up steps for your hackamore to function as it should. Choose the right size bosal. Measure from the inside of the nose button to the top of the heel knot. A 10 inch will fit most small horses and ponies. 11 inches is for the average horse, and 12 inches will fit most larger-headed horses. Shape the bosal to your horse. A well-made bosal has a malleable rawhide core that can be molded to fit an individual horse. Once it’s been shaped, the bosal should apply even pressure around the horse’s nose. A poorly fitted bosal will leave gaps and sit heavily on the sensitive nasal bone (which has only a thin layer of skin for protection). 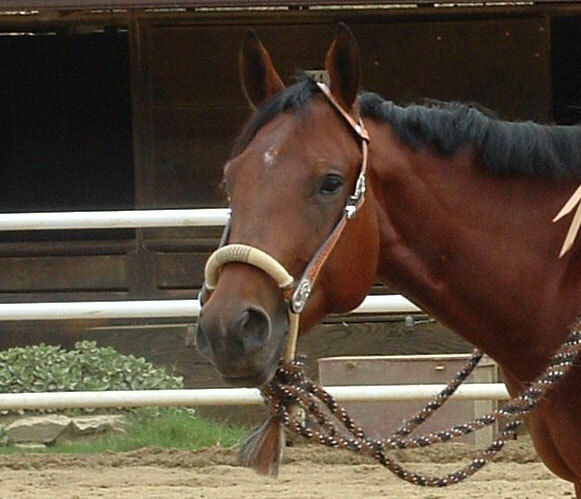 A well-shaped bosal will not bounce or rock as the horse works, and will never rub or scuff skin or hair. Shape the branches of the bosal. They should be in contact with your horse’s face, without squeezing or pinching, applying pressure only when you pick up the reins. They may need to be spread to match the contours of your horse. Bend the branches to enhance the signal your horse feels when you pick up the reins and create a quicker release. Bend them by pushing the heel knot and nose button toward each other. 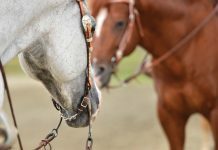 When you set the bosal on your horse’s nose, put the curve of the bend toward your horse, so that the heel knot is positioned forward toward your horses chin. Adjust the hanger. Raise or lower it so that the bosal rests on the nasal bone above the point where the bone tapers down toward the nostrils. Look for a raised area on the bone, the nasal “bump,” as a landmark and starting point for a position that works best for your horse. Don’t go below it or you can injure your horse. When the bosal is in the right place, the branches will rest alongside the chin groove with the heel knot below. Tie the mecate. Here is an opportunity to fine-tune the adjustment of your hackamore. The bosal becomes more snug or loose depending on how many wraps you take and how tight you make them. Leave enough space between the wraps under your horse’s jaw so that the mecate doesn’t touch him when the reins are slack. Tie back the hanger if necessary. Have someone watch to see if the hanger is slipping into your horse’s eyes as you ride. Whether or not this is a problem depends on the length of the nose button and shape of the horse’s head, and is not uncommon. If the hanger is getting into your horse’s eyes, tie a length of thin strip leather, a leather shoe lace will work, to the hanger and position it under his jaw. Now you are ready to enjoy the benefits of bitless communication with your horse. Liked this article? Here’s more on riding in a hackamore. The picture is showing a bosal not a hackmore. They are two very different things. Please do fact checking before publishing articles. I find that articles in horse magazines are of a personal opinion and not based in fact. You’re right, i noticed it right away also, (not that it’s too hard to differentiate between the two). Is Your Western Saddle the Right Size for You?